That was good, now what? A guide to life after university. This is a very simple guide to getting your life up and running after university. Please note that this info packet was designed for UK students in mind but that doesn’t mean the tips don’t apply here! Ignore the bits about student loans pertaining to UK banks and get stuck into the helpful bits to get you up and away on the journey of life! There are a few main areas to sort out after university – money, jobs, the roof over your head and of course the fun stuff. There’s also the ‘Whaaaaa??! !’, ‘Where am I?’ ‘Now what? ?’ feeling….It’s all covered with minimum fuss in our guide – download it now for free. The That was good now what? 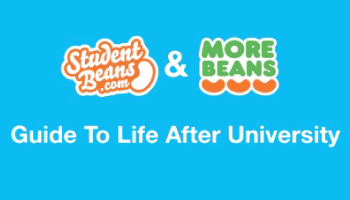 Guide to life after university was created using the very best tips, tricks and advice from studentbeans.com writers AND the thousands of graduates who have been through this period very recently. Download the simple way to get your graduate life up and running, now.